In December we finally got our hands on a working prototype of our Linux Agent. It's been in the making for quite some time and now that it's in alpha stage, we can finally start 0patching Linux user space code. The Linux agent still lacks some of the fancier functionality our Windows agent supports, but it's ready to be taken for a spin. Now I can't stress enough how big of a deal this is. With over 65% of web servers running some flavor of Unix, patching security vulns in high availability Linux environments could become much less of a problem. If we take a zero day like Heartbleed for example, the time it takes to deploy an official patch isn't only comprised of the time it takes the vendor to release the fix, but also of the time it takes DevOps to test and deploy it. We aim to shorten this considerably by making patches tiny, easy to review and even easier to deploy, avoiding the need to restart the server. When developing and testing the Linux agent on Ubuntu we already created a patch for Heartbleed and while there's still a lot of vulnerable servers out there, the hype train is nearing its last stop. So we needed something new for the grand unveiling and Chris Evans (@scarybeasts) was kind enough to provide us with just the thing. It also gave us an excuse to port the agent to Fedora and increase our Linux flavor support. This bug was published last November on Chris's blog. The flaw is located in gstreamer's VMnc decoder that handles the VMware screen capture format. It's a pretty straight forward integer overflow and Chris provided a PoC. I started off by creating a Fedora 25 virtual machine, then tried playing the PoC with totem, a video player native to Gnome which uses the vulnerable version of gstreamer on an unpatched Fedora 25. Playing the PoC with totem resulted in a crash. Chris was kind enough to do a detailed analysis of the bug which helped a lot. He figured out that the integer overflow occurs in vmnc_handle_wmvi_rectangle method in vmncdec.c, which is a part of the gstreamer-plugins-bad package. You can view its source on gstreamers github. As Chris explains the overflow occurs because of user-supplied rect->width and rect->height that are multiplied with bytes_per_pixel to allocate the image data buffer. Both variables are signed 32-bit integers. If high enough values are supplied the result is an integer overflow. 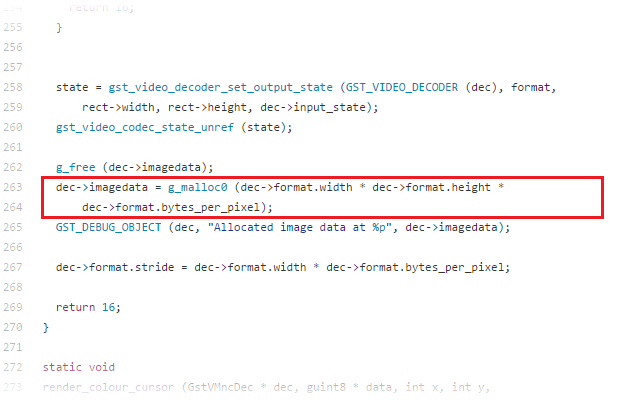 The subsequent memory allocation (marked in red on the image below) produces a buffer that is smaller than the image data, which results in a buffer overflow. I disassembled libgstvmnc.so and located the point in the function vmnc_handle_wmvi_rectangle where the height and width are multiplied and the buffer is allocated (marked in red on the image below). As you can see, we check if the carry flag is set after each imul and return an error if set. After applying the patch, however, totem still crashed. After some debugging I figured out that returning an error in vmnc_handle_wmvi_rectangle wasn't enough. Instead of looking for the cause I took a look at the official patch below. The official patch can be found in function vmnc_handle_packet. You can see that both width and height are checked if they're larger then 16384 or 0x4000 and an error is returned if they are. Our patch should do the same. 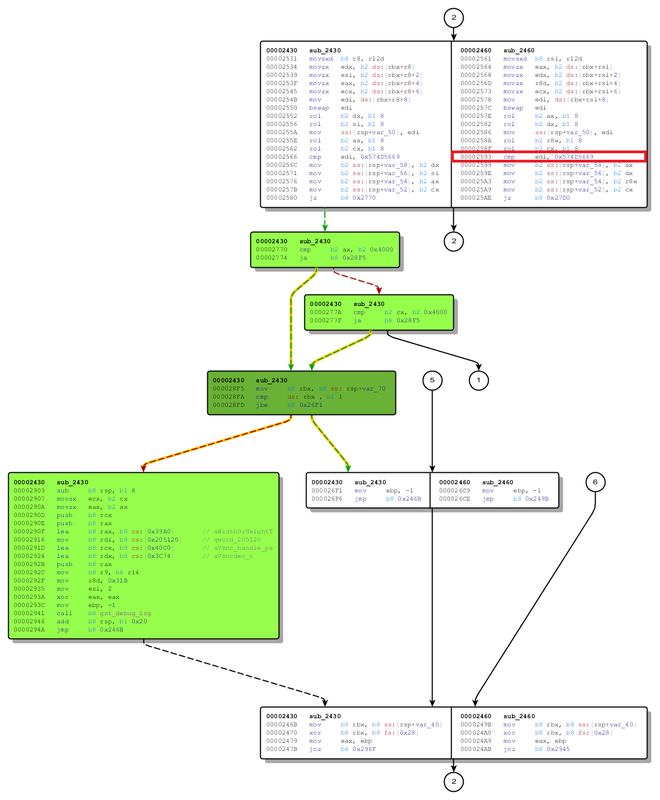 I disassembled both the vulnerable and the patched version of vmnc_handle_packet and used Bindiff to look for an appropriate patch location. The image below represents the combined view of both codes. The green code was added by the official patch. The patch successfully stops the integer overflow and subsequent memory allocation, actually making the file playable again, just as the official patch does. Here's a short video of our Linux 0patch agent and the patch we just developed. As you can see, totem crashes when trying to open the PoC. After enabling the patch by copying the patch file to the patch store folder, totem no longer crashes and the video is actually playable. Effort wise, developing this patch took about 8 hours. That includes reversing libgstvmnc.so, trying out a faulty patch candidate, analyzing the official patch and implementing an adequate patch candidate. This was a relatively simple patch but I wanted to showcase our Linux agent and its capabilities which are almost on par with what we're already doing on Windows. We're continuously working on expanding the OS platform support so we can one day bring 0patch to everyone who needs it.